The cuteness factor was kicked up a notch this Christmas with the addition of my brother's baby girl Annika! She's 5 1/2 months old and is just the sweetest thing. 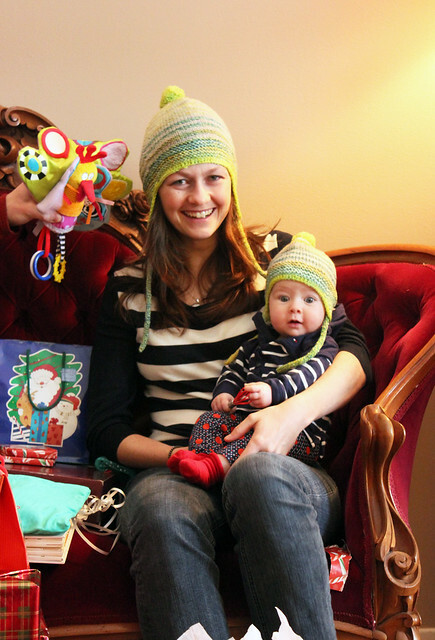 Annika was spoiled with lots of adorable and fun gifts, including a bunch of knitted items made by me and my mom. 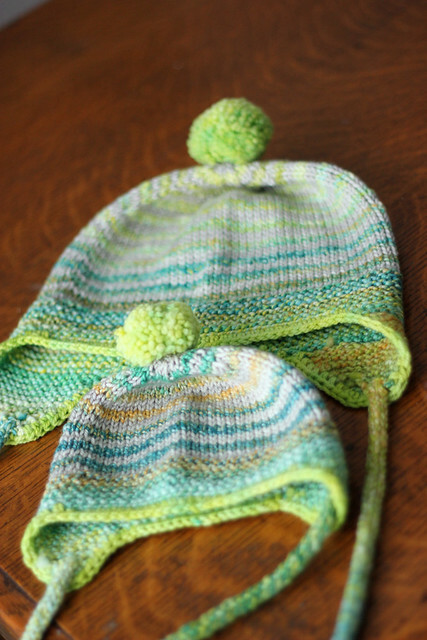 Part of my contribution was a pair of matching mom and baby Thorpes knit for Annika and her mom Amanda. Remember how I recently mentioned that I needed to find worthy projects for my handspun? Well, this is one of the projects that I came up with. 2 hats, twice the awesomeness. I'm thrilled with how these came out. Luckily, mom and baby love them too! Plenty of knits were gifted for Christmas this year. Clearly I took the accessory approach and knit a bunch of small, manageable projects. Chris got in on the Christmas knitting action too and helped me to knit 3 hats for the men in his family. 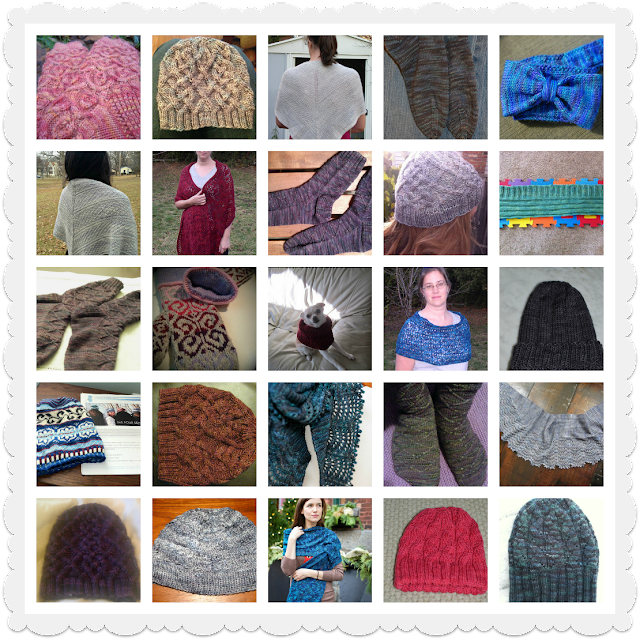 Some of these knits have yet to be blogged about since they were gifts and I didn't want to spoil the surprise. Today was our last day of Christmas gift exchanging, so all the details will be coming soon! Christmas dinner at our place was a success! We managed to fit 13 people at one very long, improvised table. The food was delicious, the company was terrific, what more could you ask for!? In typical Tanis fashion I took 2 photo's to document the entire night. I had the camera out and ready, intending to make Christmas 2012 the day I change my bad photo-taking habits, and then... nothing. At least I did get this shot of Chris with his beautiful turkey! 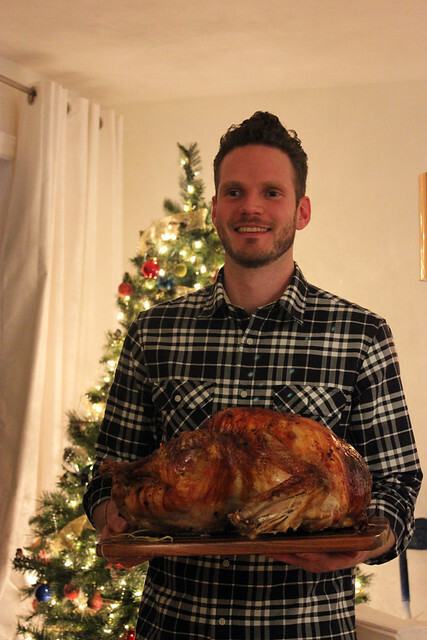 It wasn't his first turkey, but it was probably his biggest and his best. It was perfect! What a champ. Totally should be wrapping gifts, or cleaning house, or making lists, or doing basically any type of readying for Christmas you can think of. Instead, I'm taking pictures of yarn. I just can't stop. Etsy Update: There will be a pretty massive One Of A Kind Etsy shop update on boxing day, December 26th at 12pm EST (noon). I've got LOTS of thrummed mitten kits, Green Label, Blue Label, Yellow Label, Red Label, Purple Label and Orange Label. I should hvae enough stock to last more than 20 minutes. Fingers crossed. Happy boxing day shopping! Christmas is just a few days away. It's been snowing on and off today (wet snow, but better than nothing!) I've got just about all my pre-holiday work done (I should be finished by the end of today). 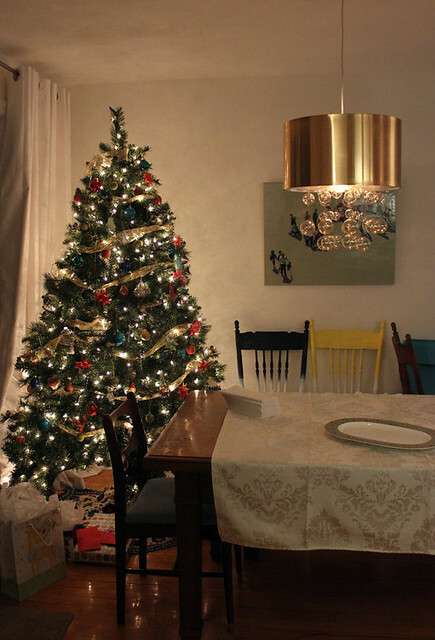 We're hosting a big Christmas dinner at our place this year, which is a first for us. We'll have 13 friends and family over and I'm officially getting really excited about it! There was a moment of terror when I realized how much planning, prepping, cleaning, cooking, shopping and spending is involved in hosting Christmas dinner, but I've made my lists, we braved Costco this morning, and I now feel confident that we can handle it. I also managed to snag the very first super cute unisex onesie I've seen since I've been pregnant (at Costco, the Pekkle brand) so all in all today is a win. I've been knitting like crazy. 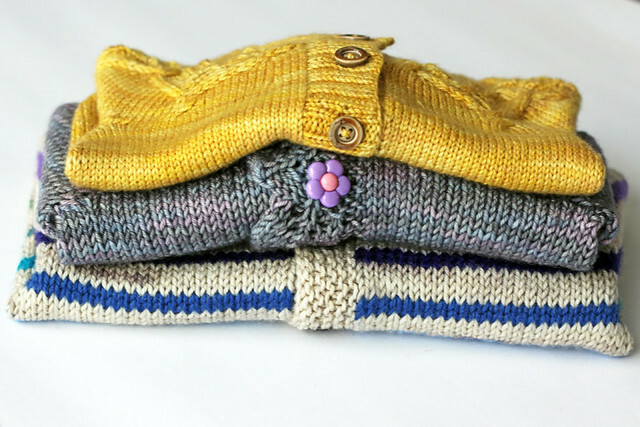 Small, awesome, instant gratification knits. I finished a baby sweater in less than 24 hours last weekend. I've knit 2 hats this week, have almost finished a sock. So much knitting to share, but it may have to wait until after the holidays. 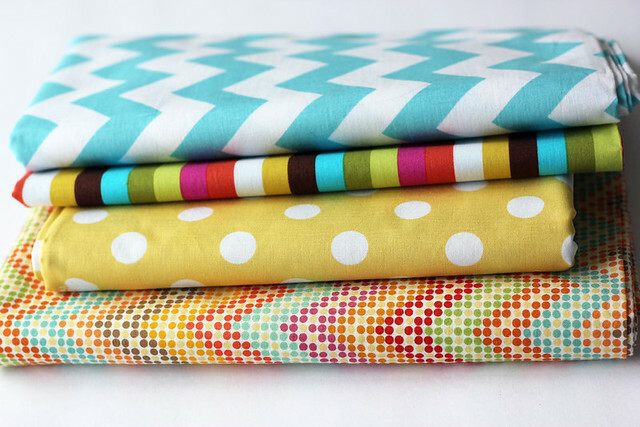 In other exciting colourful, fibery news... the fabrics that I ordered to sew items for the nursery arrived this week. I fee like Christmas came early for me! I may wrap them up and put them under the tree because I love them so much. Hoping you are all excited about the next couple of days, getting all your holiday plans in order and are able to sit back and really enjoy this magical time of year! Chris and I are spending this last week before the holidays working on a massive One Of A Kind Etsy Update that will go up boxing week (I'm not sure what day yet exactly, I'll keep you posted for sure!) 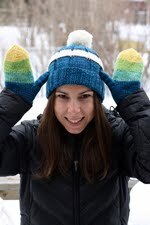 The update will include as many Thrummed Mitten Kits as we can possibly make in a week. 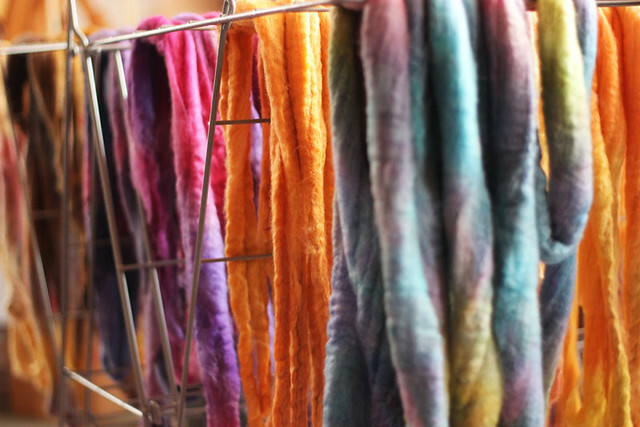 Yesterday was a BFL roving dyeing day. Today my office is full of roving that is magically going from damp, limp and uninspiring to dry, fluffy and dreamy! Roving drying is one of the weirdest, most awesome things ever. This sweater is beautiful. I'm not sure what more I can say about it. Ravelry project page here. Blog post done. Joking, there is always so much to say about knits, no matter how wee they are! I hadn't knit a new little something for my bun in the oven since I knit the Coolbreeze Baby Cardigan back in September. Now that most of my Christmas crafting is behind me, I was really excited to start a little something for the baby. Baby sweaters knit in Purple Label Cashmere Sock yarn are almost definitely my favourite. It is just so incredibly soft and snuggly, the thought of cuddling a baby swathed in this material is heavenly. I can't wait! 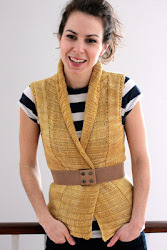 The pattern is the Little Oak Cardigan by Alana Dakos, and really, it's a delight. I'll go ahead and repeat what everyone who's ever knit this pattern before me has to say about it: it's just the right amount of simple, bottom up, stockinette stitch. Then, right when you might get bored with it, it's time to work the very complicated cable section for the yoke. Before you can get too sick of the complex cables, you're done! Then all that's left is the button band, and I love button bands. So really, this knit is perfect. I really love my Gold colourway for baby knits. It's soft and warm without being too pastel or sweet. 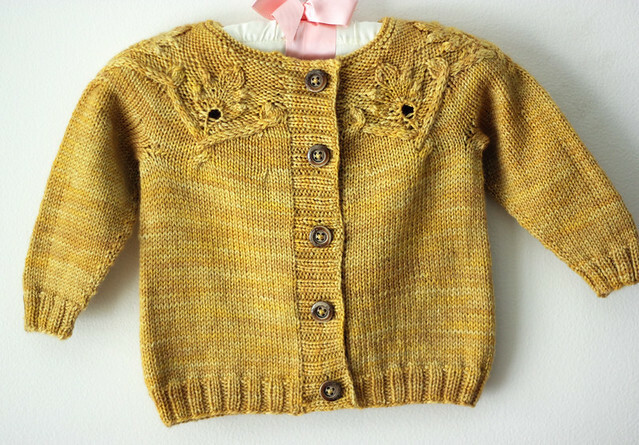 I happen to love a lot of colourways for baby knits (Pink Grapefruit, Seabreeze, Dove, Frost...) but Gold is definitely high on that list. As an interesting little coincidence, I ordered the fabric pictured above for my crib bedding while working on this cardigan. Isn't it neat how the two complement each other so well? Psst - Tomorrow the price of a Year In Colour Club membership will go up! If you're considering treating yourself to the gift that keeps on giving, now is the time! I've had a lots of request from people wanting details about my tree skirt, it's my Flowers in the Snow afghan wrapped around the base of the tree! 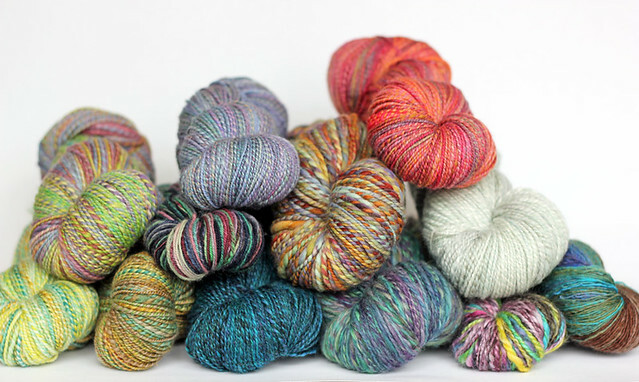 This is, more or less, my stash of handspun. I'm extremely in love with just about every skein. So much care and effort goes into every single skein that it becomes very difficult for me to pick a project worthy of my handspun yarns. Baby projects come to mind as a really good use. Typically the yardage I get out of one skein is enough for a baby sweater. 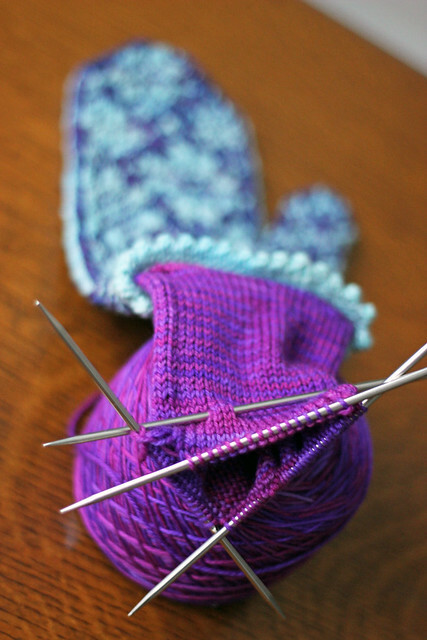 Since babies aren't very hard on their clothes there is little risk that the finished knit will get abused or damaged. 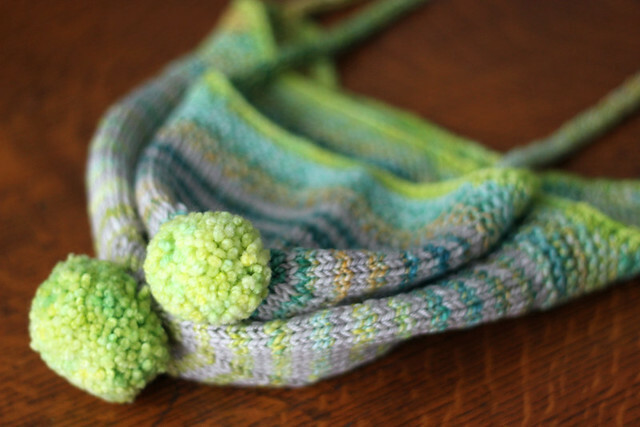 Baby projects are perfect heirloom knitting for special skeins. 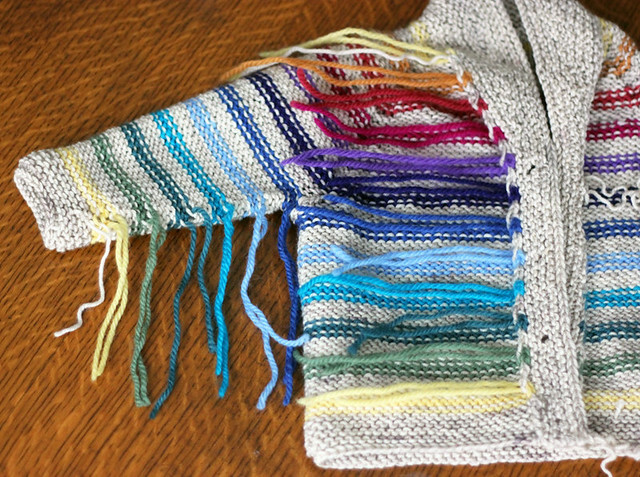 I've knit a few baby projects using my handspun already: here, here and here. These five skeins jump out at me as being particularly baby appropriate. Any recommendations for the perfect baby sweater pattern that would highlight the beauty of handspun? 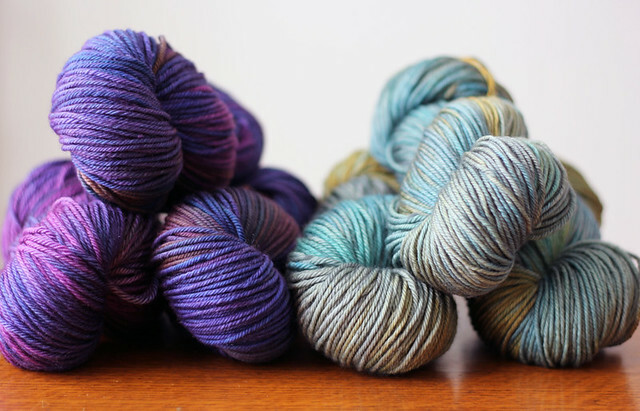 I'm open to a pattern with stripes or colourwork, so I could combine a skein with some of my hand dyed yarn and then have some handspun left over for a hat or something. All ideas are welcome! I had decided that I wasn't going to send out a custom printed Christmas card this year. 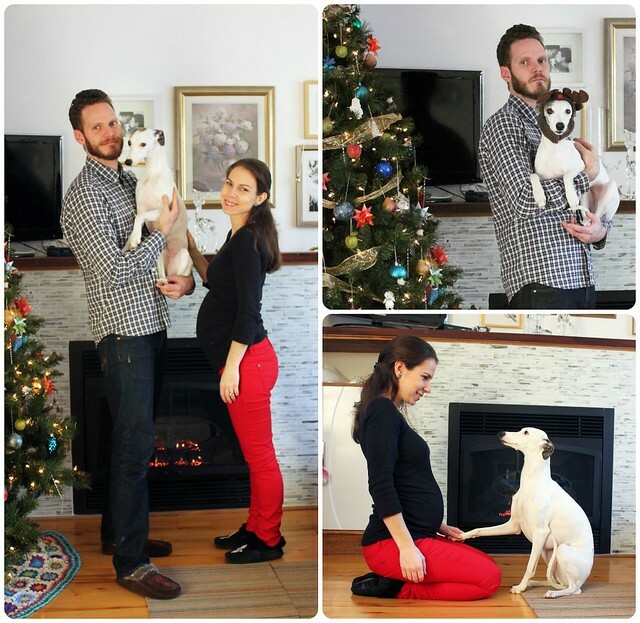 I figure that next year we'll have an adorable little baby to dress up as an elf and photograph to our hearts content, so this year we could take a break from super cute Christmas cards. But then I started getting cards in the mail, and every single one makes my day. I changed my mind and convinced Chris that we should do a quick photo shoot with our reindeer Stella and print up something quickly to send out to our friends and family for the holidays. These are a few of the highlights from yesterday's Christmas photo shoot attempt. Not exactly inspiring! I have to point out Chris' expression in the photo of him with Stella (top right). He hated the antler hat on her. He was convinced that she was totally humiliated and insisted we take it off. Then there's that super weird one of me and Stella kneeling and gazing into each other's eyes like we're in love (we are in love!) Oh well, we tried. I wrapped my first Christmas present of the season with lots of love and attention. 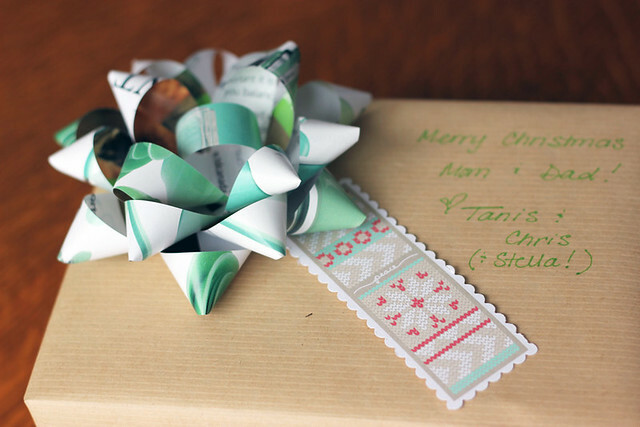 That awesome little knit print gift tag is a free download here. I printed a sheet on cardstock and then cut the tags out with craft scissors. The bow I made myself out of a sheet torn from a magazine, the tutorial can be found here. It uses a ton of tape and takes a couple of minutes to make, but I think that it's pretty cool! WIP's that are almost FO's! I hope everyone had a wonderful weekend! Our weekend was lovely, low key and just the way I like it. We didn't do anything monumental, but we were able to scratch a few more Christmas gifts off of our shopping/crafting list, make a tiny bit of progress on a few small projects going on around the house and I managed to get lots of knitting done. Perfect. No special FO posts yet, but I've got 3 projects that are so close to the finish line I can taste it! 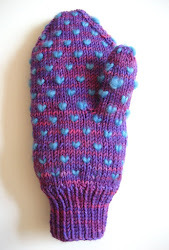 These mitts are a second run at the new mitten pattern I'm working on (sneak peeked here). 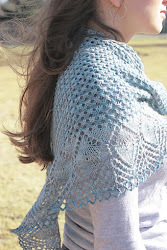 The pattern has been sent to the test knitter and I'm hoping to have it ready for you all very early in the new year. The bright Jewel cashmere lining on this pair is to die for! Cannot get enough of it. I should be finishing up the lining/blocking/pattern editing later on this week. Which brings me to my next almost FO... I lined 99% of these mitts with some leftover Purple Label in Gold that I had after completing this small project. I had to crack into a new skein for just a few yards at the tip of my mitt. 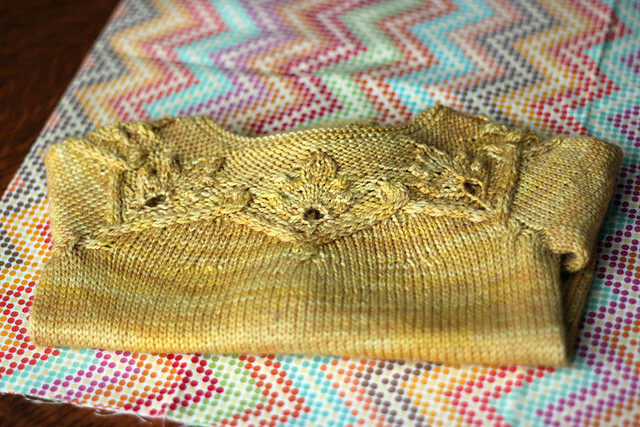 I love knitting with Purple Label, and I love the Gold colourway, so I decided to let the happy Gold knitting continue and I cast on for an adorable little baby sweater. This bad boy has been blocked and is just missing the perfect buttons. 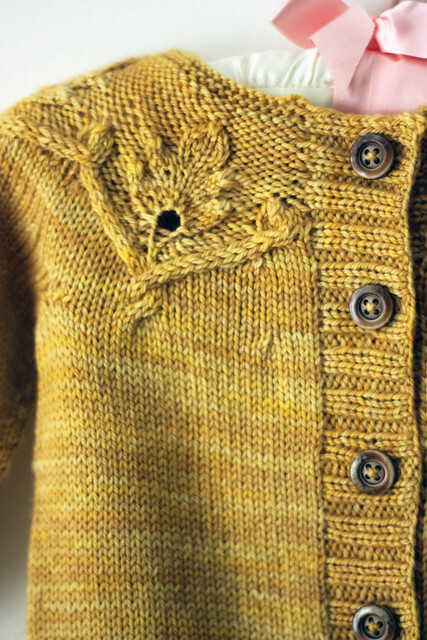 The pattern is the Little Oak cardigan by Alana Dakos. After finishing one little knit I immediately cast on for a second. This fella still needs to be blocked, buttoned and oh yeah, there are a few ends to weave in too! Full details to come. (From left to right) Row 1: smallfanfan's Shift of Focus , danimily's Stockholm Scarf , knitstashley's November TFA Knit Along , GreenBeanString's Winter Bloom, somesylvie's Mitts for Jen and Marie . Row 2: JamieLynn16's Joyce's Fiddlehead Mittens , hazelbranch's Peregrine's Solstice Oak , PamDKnits' LT's Hugging Monster , KillerBunny's Secret Christmas Mittens, knerdy's Newborn Vertebrae , Row 3: lambdamuepsilon's Wear the Flag, binthereknitthat's Sweet Lilac, tanisfiberarts' Abby's Heart Hat , MaryKnits7's Arching Leaves Socks , rdtebby's Windward . Row 4: tanisfiberart's Elliot's Crazy Hat , CarlaBeeCreations' Christmas Dinner, tanisfiberarts' End Of November mitts , pfong001's Rainbow Fish Hat Toddler/Preschooler size, Quellefille's Wool Leaves. Row 5: binthereknitthat's Alpha Storm , CecileinIndiana's Four Season's Hat , RoseHiver's Angela's Mittens , hotcheese's Cabled Canuck, debbieknits5000's winter hat. 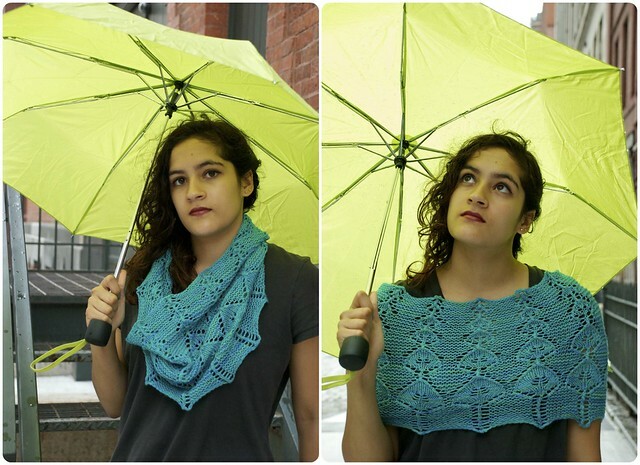 The Accessories KAL featured TFA patterns only (did you know there are currently eighteen TFA patterns for accessories?! Plus all the 2012 club patterns!) and 38 knitters took part. Naturally there was some crossover between the KALs, as accessories are often the perfect knitted gift. 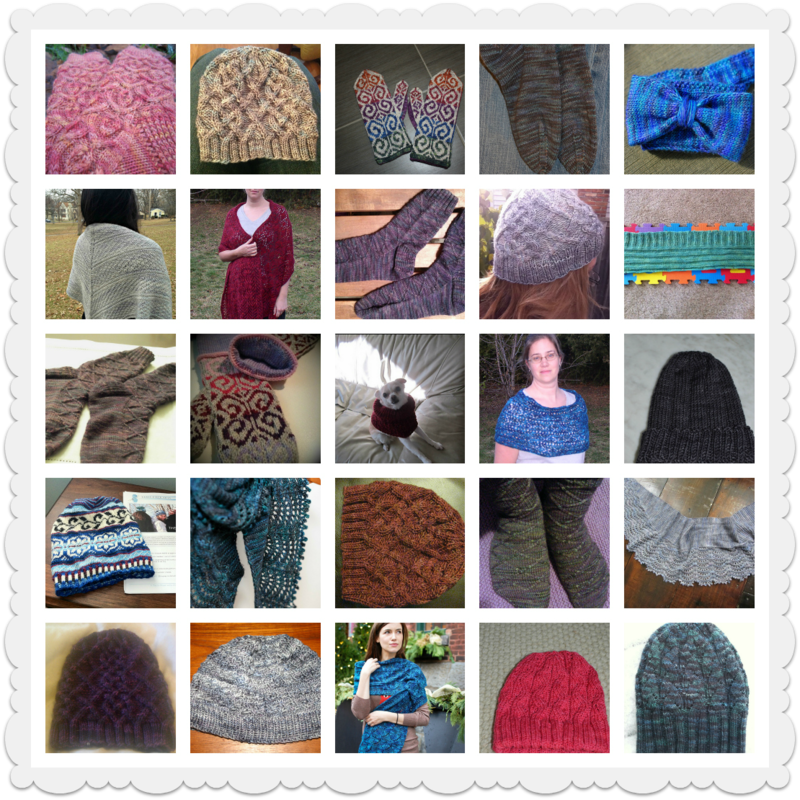 (From left to right) Row 1: knerdy's Arching Leaves Socks , AmyMercer's Cabled Canuck, Janalukas' Guernsey Triangle, Dheuff's Christmas Socks, knittedblissJC's Strada , Row 2: YarnAndYarn's KAL Guernsey Triangle , Janalukas' Winter Fairview , GreenBeanString's Sleep Tech Dressy , KillerBunny's Cabled Canuck hat, TTeresa's /infinitude Scarves (3). 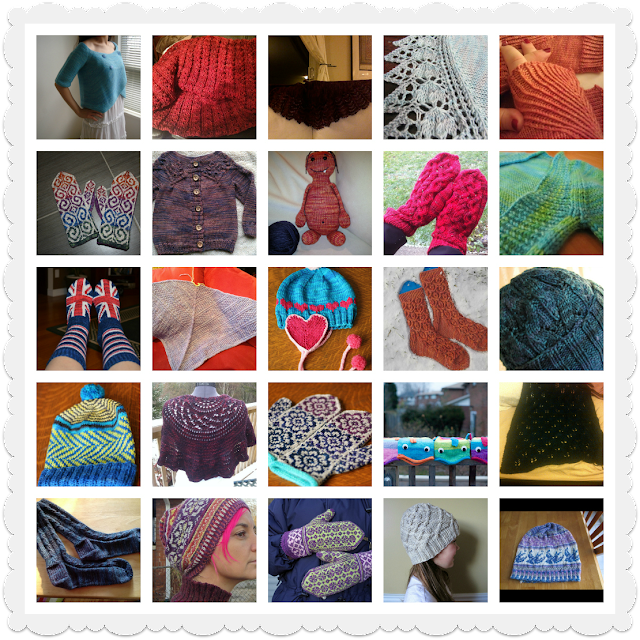 Row 3: twinsknit's KAL Socks, tankinisurf's Fiddleheads , debbieknits5000's buttonless buttons cowl , Janalukas' Deep Sea Solaria , Dheuff's Hockey Hat . Row 4: Prairie-Knitter's The Four Seasons Winter Hat TFA KAL , knitininto's Stormcrest , yarnslayer's Cabled Canuck, Tarazed's Martini Olives, GreenBeanString's Moonset, Row 5: Quellefille's Cabled Canuck , frazzled01's Gin and Tonc , knittedblissJC's Nashira XL , Dheuff's Holiday Hat, suzieville's Stormy Winds . So. Many. Beautiful. Knits. It was so much fun checking the thread every day, sometimes several times, to follow everyone's progress through WIP photos, comments, setbacks, and triumphs. November was an amazing month, all thanks to these amazing knitters. 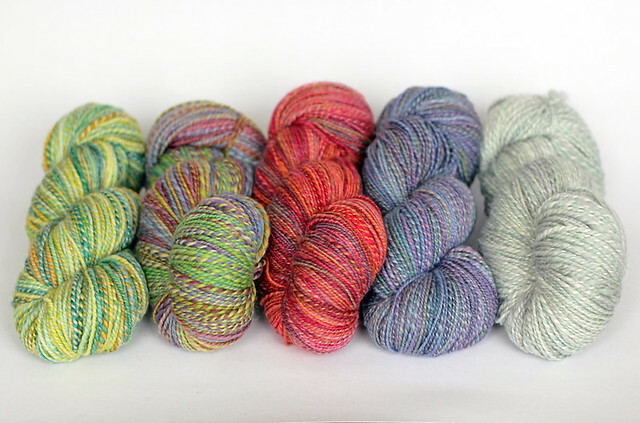 One KAL participant from each thread was chosen at random to win a special skein of yarn. 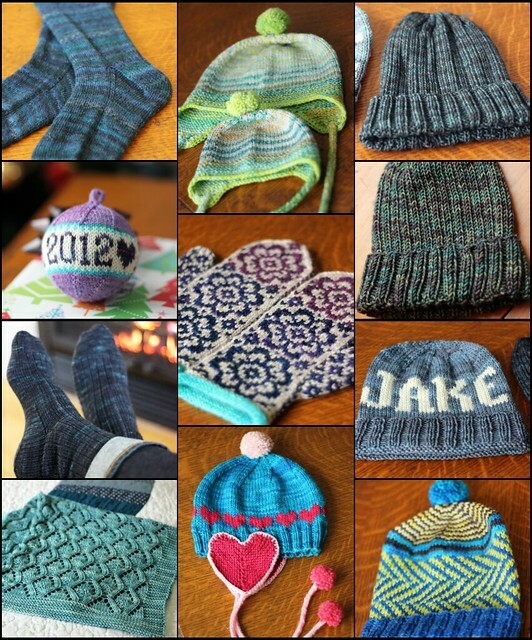 The winner of the Holiday Knitting KAL is knerdy, and the winner of the Accessories KAL is Janalukas. Congratulations, knerdy and Janalukas! 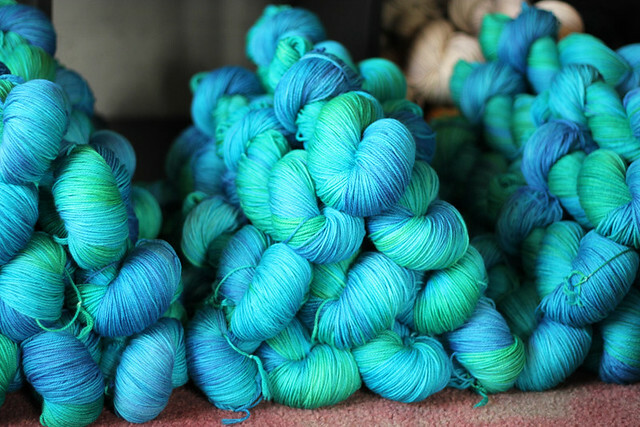 The final installment of the 2012 Year In Colour Club was sent out last month and the featured colourway was this gorgeous, vibrant turquoise shade that I've called Tropics. Dyed in one of my favourite bases (Purple Label Cashmere Sock yarn) this yarn could not by any more "me". I love it. I'm already planning baby knits in this colourway. 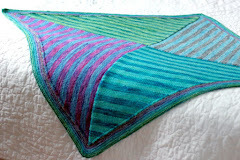 The November pattern was contributed by Kirsten Kapur of Through the Loops. Her beautiful, textured Collister cowl really makes the most of this super soft yarn by allowing for lots of close-to-the-face snuggling with the cowl. 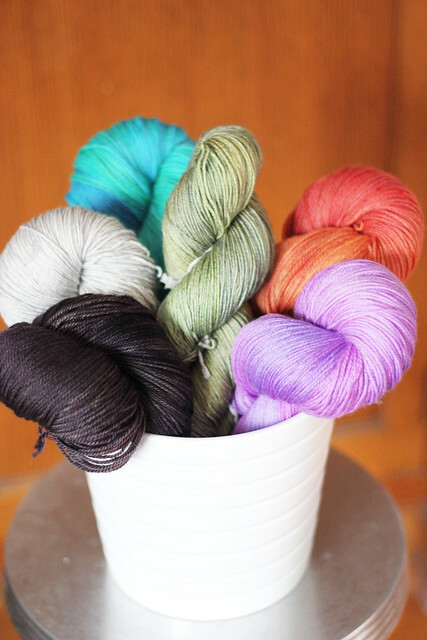 As we wrap up another Year In Colour I'm once again amazed at how great all 6 colourways look together in this yarn bouquet. I tend to develop each colourway individually. I'm always cautious to make sure that I don't send out two similar colourways, but other than that, we don't plan for the 6 annual colourways to read as a collection. Despite the lack of intention, the groupings we end up with always look fantastic! Check out last year's collection here. 2013 Club memberships are already available. Next year is sure to be lots of fun! Some of the 2012 Club colourways are being considered as permanent collection fixtures, what was your favourite this year? Etsy Update today at noon! Just popping in with a quick reminder that there will be an Etsy Update today at 12pm EST (noon!) featuring a whole bunch of Thrummed Mitten Kits. This will be the last update before Christmas so get them while you can! Every year I get swept up in the excitement of Christmas crafting. I make gifts, I bake, I do a little bit of decorating around the house and I usually get inspired to make some sort of ornament for our Christmas tree (my last big ornament kick was these sparkly stars from 2 years ago, which I still stand by as being one of the best things about our tree!). I'm a very big fan of trees that are decorated with personal touches. Our tree is decorated with a combination of purchased ornaments, hand made ornaments and ornaments that were handed down from our parents. They come together to make one very special Christmas moment. We're having people over for an early Christmas dinner party tomorrow night so it seemed like the perfect excuse to put the tree up and get things feeling a little more festive around here! I spent the majority of last night with the tv off, the fireplace on and my sights set on trimming the tree. 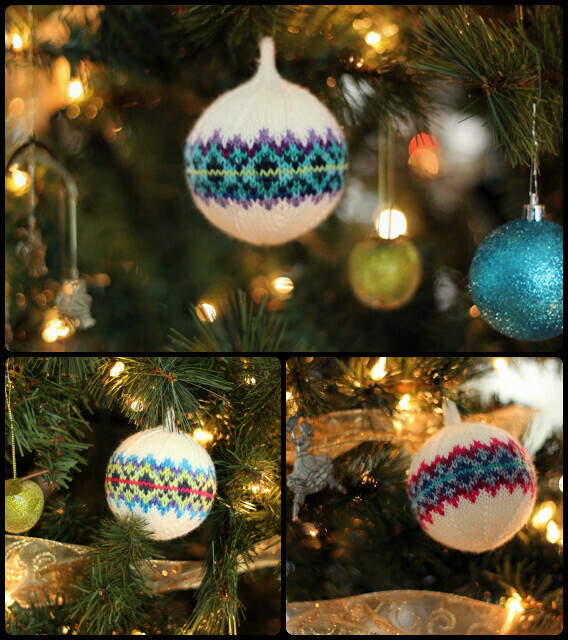 This year I made a few knitted ornaments that I totally love. I used the Balls Up! pattern, an 8cm styrofoam ball and leftover sock yarn. They are perfectly round, crisp and clean, they make my day. I think that they are the only bit of wool or knitting on my tree at the moment, clearly I needed them. 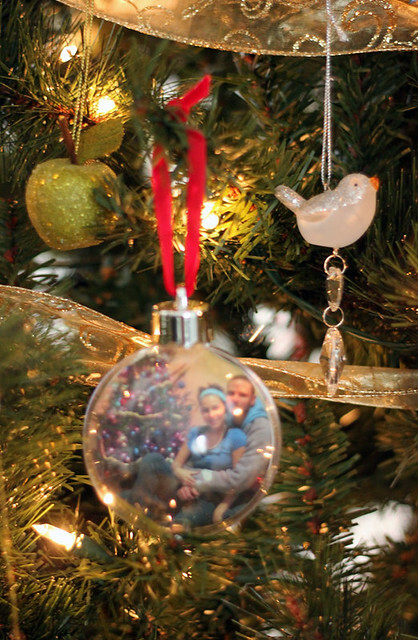 Another new ornament to the tree this year is this little photo ball I picked up for a few bucks at the grocery store. I put a picture of Chris and I from our first Christmas together in our first apartment with our first tiny little charlie brown Christmas tree back in 2006. It doesn't seem like that long ago, but man has a lot changed since then. It's so fun to have these little mementos to be reminded of special times from the past.